As agencies have long understood, sponsorship proposals can work both ways - as a brand you don't always have to be on the receiving end. Heck, sometimes the property (or the sponsorship opportunity) may not even yet exist (or know there's interest). In the case of YUM! 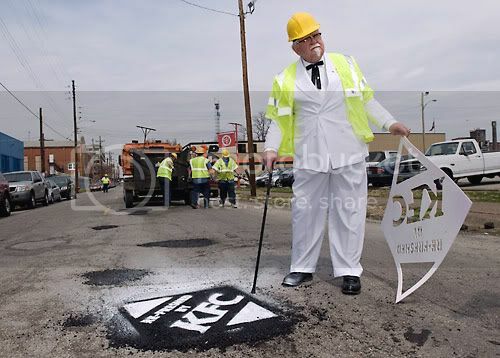 Brands, KFC recently saw America's road troubles as an opportunity to communicate their "Fresh Tastes Better" campaign, firing off a proposal to America's mayors that would allow Colonel Sanders and his team to fix the city's streets in exchange for KFC branding on each filled pothole. During this age of corporate cynicism, Ad Age points out that this is part of a larger OOH (out of home) media trend that features companies trying to move beyond traditional signage and make a memorable cause tie-in. Examples are everywhere. Ad Age points out that Charmin provided a public restroom in Times Square for the third year running and Samsung has installed electrical charging stations in many major airports to help travelers stay connected while in limbo. As budgets tighten, parks, streets, and city centers throughout America are for the first time being considered as "sponsorable" assets. The question is, will city councilmen who it seems many times misunderstand the idea of corporate sponsorship altogether, be sponsor-friendly? The answer may be no in Chicago: Brian Steele, a spokesman for the Chicago Department of Transportation, which is charged with repairing the city's potholes, said "We don't allow any type of printing or advertising placed on a city street or sidewalk."